Hundred pea pasta! So called because when I looked down at my first bowl I thought, woah, there are like a million peas in this pasta! Surely, at least one hundred. 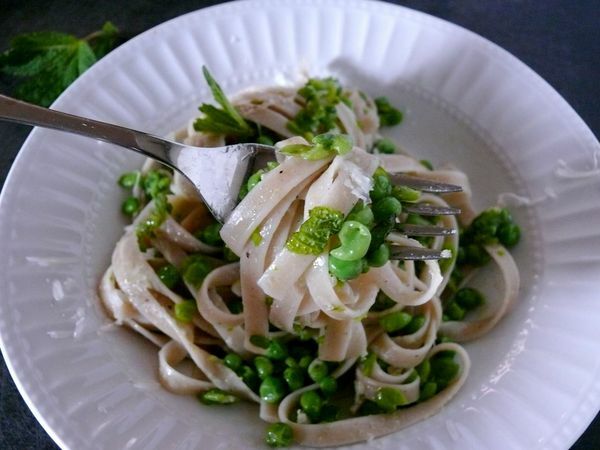 June is the ideal month to bathe your pasta in an exorbitant amount of very fresh peas, but at all other times of the year, use frozen peas for this pasta and it will be simply perfect then too. Bring a large pot of water to a boil. 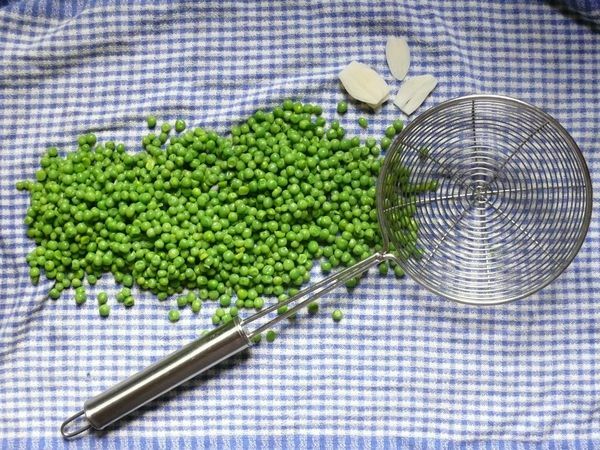 Add the peas to the boiling water and cook for 1 minute, then using a slotted spoon, transfer peas to a clean tea towel to drain, gently blotting excess water from the peas, then let them air dry. Do the same with the garlic slices. Cover the water and keep it at a boil while you continue. Heat 2 tablespoons of the oil in a large skillet over medium-high heat. Add the blanched garlic and fry the slices until they start to turn a pale gold, about 3-4 minutes, stirring occasionally. At this point, salt your boiling water for the pasta, add the noodles to the water, stir and let them cook. Meanwhile, carefully gather the tea towel and pour about 3/4 of the peas into the skillet. Add 1/4 tsp of salt and mix well. Using the potato masher, mash the peas roughly and press the garlic slices to mash those well. Add 1 tablespoon more of the oil to the pan and then add the remaining peas, the remaining 1/4 tsp of salt, the pepper and half of the mint. Mix well and cook, stirring and scraping the bottom of the pan with your spoon, for 1-2 minutes until everything is well incorporated and the whole peas are heated through again. 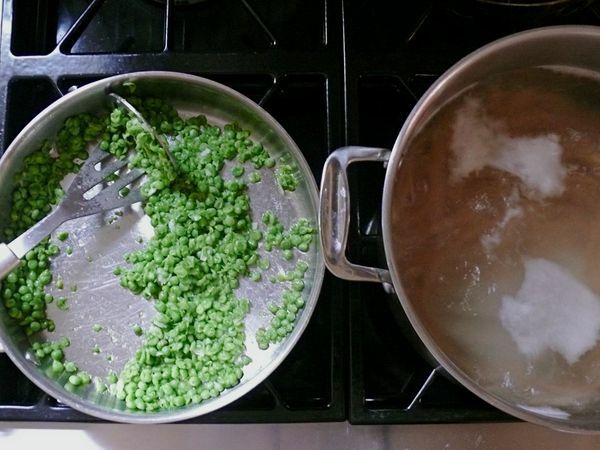 Ideally your pasta will be done at this time, but if not, remove the peas from the heat. When the pasta is cooked, drain and add the noodles to the peas and mix well. Add half of the cheese to the hot pasta and stir through. Add the remaining 1 tablespoon of oil, cheese and mint to the pan before serving, or sprinkle them on top of each individual serving once the pasta is plated. Just made this! One of those spider strainers would probably work better to get the peas out of the water unless you have a trick with the slotted spoon I don’t know about? the spider is superior to all.